Behold Philadelphia's newest mascot, Gritty, repping the Flyers. 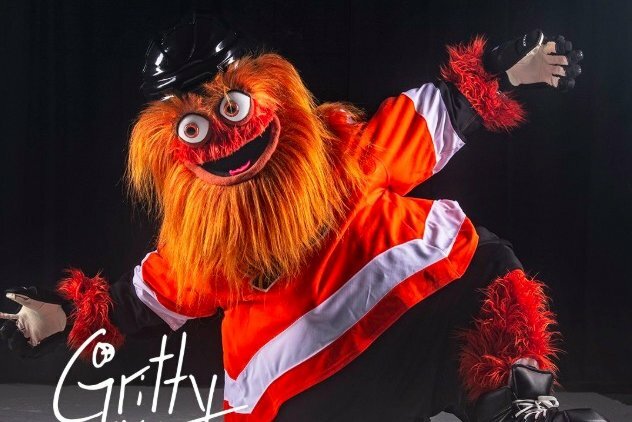 Just in time for the NHL preseason, the Philadelphia Flyers have a brand new mascot named Gritty, and it's... well, it's a lot. Just see for yourself in the grand reveal video below. As you can see, Gritty has a lion-like beard, disassociated eyeballs, and a gyrating pelvic region. He was revealed Monday at the Please Touch Museum and is the Flyers' second-ever mascot, following the short-lived mascot Slapshot of the 1970s. What is this fuzzy orange creature exactly? That's a great question. Here's what Twitter had to say. Redditors on r/philadelphia had opinions, too. Plus Gritty has his own Twitter account. How thrilling! The Flyers even posted a little bio on the creature, though it doesn't do much to boost his identity. "He claims that he's been around for a lot longer than we know it, and recent construction at the Wells Fargo Center disturbed his secret hideout forcing him to show his face publicly for the first time," the bio reads. "A number of times he's been caught eating snow straight from the Zamboni machine, and unbeknown to most, his love of hot dogs has been inflating the Flyers Dollar Dog Night consumption totals for years." Okay. So ... what do you think of the new Philadelphian?